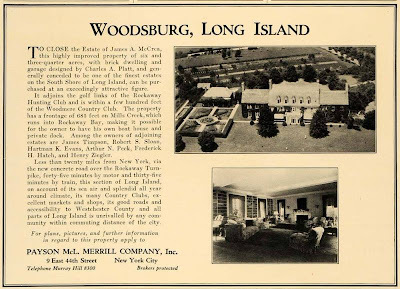 An advertisement for the James Alexander McCrea estate designed by Charles Platt c. 1909 in Woodmere. McCrea was the president of the Pennsylvania Railroad Company and was behind the construction of Pennsylvania Station in Manhattan. He retired in 1913 at the age of 65 saying in his resignation letter that he "desired a rest". The house has since been demolished. I'm very surprised to see the names of nearby property owners listed in the ad. It was more common in NYTimes articles of the time. Very nice house from what these pictures show – that library looks like a very comfortable place to spend a day reading. The NYT article Zach linked to struck me as almost comical with James McCrea whining (my term, not theirs) about what a heavy burden it was to be the president of the Pennsylvania Railroad (even though he was drawing the highest salary in the industry) & that even “His doctors shook their heads and told him to retire.” I’m sure life was so much easier for all the chainmen & rodmen (McCrea’s original job) who did not climb the corporate ladder to the top. I found a photo of McCrea: http://www.gutowski.de/Kings/McCrea_James.html . I also found an obituary notice which states: “James McCrea, formerly president of the Pennsylvania Railroad, died at his home in Philadelphia, Pa., on March 28, 1913. Mr. McCrea retired as president on Nov 13. He had been in the service of the company forty-eight years.” So he died only four months after retiring at the age of 65 … & not on Long Island. I suspect his health would have been poor regardless … & that he had much better doctoring than most of his employees. During the time McCrea was with Pennsylvania Railroad, there were two long economic depressions, perpetual rate wars, and, of course, the Erie Scandal, which battered everyone's stock and threatened many affiliated railroads with collapse. State legislatures were notoriously corrupt, and navigating ones way through all that could not have been much fun. More than one railroad president was effectively killed off by the stress. P.S. I am entirely unwilling to romanticize manual labor over senior management. But I wonder how that $50K compares to the average wage in his company. We often read that current CEO salaries have flown way ahead of average wages, in contrast to some idealized, "more just" past. McCrea's salary, however, seems almost "modern." P.P.S. If you haven't already read it, I highly recommend the recent biography of Cornelius Vanderbilt. South Shore estates were on much lesser acrage,and seemed so much more managable, I find it strange that they were the ones to vanish before the much larger, and sure more expensive up-keep North Shore estates. Anon 9:53; location, location, location... At twenty degrees or so off true south, the endless miles of brilliant white, sugar sand beaches made for an irresistible draw. Who wouldn't want to escape to such a paradise on a swelteringly hot New York summer day? 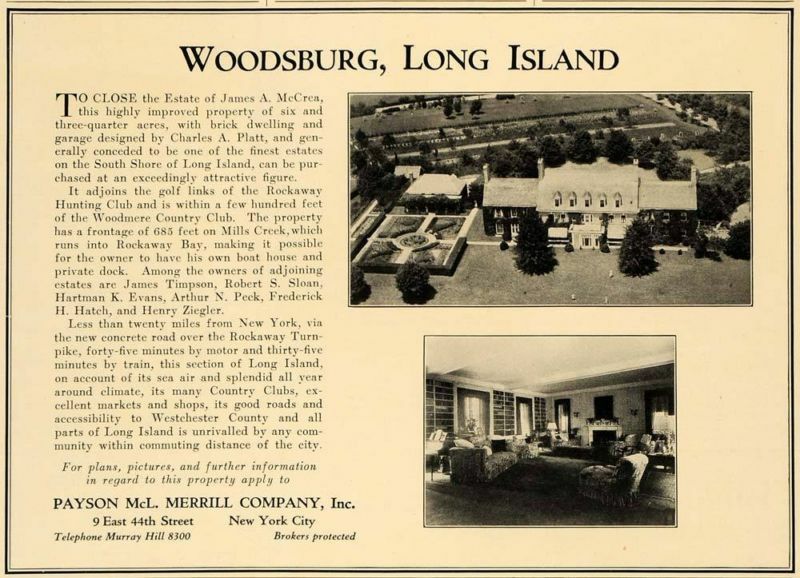 If the house was adjacent to the links & within walking distance of the hunt club, it most likely was sited in the midst of this tony Woodsburg neighborhood. With the encroaching web of Moses' trains & parkways making easy access to what were indeed (and thankfully in many places still are) some of the world's finest beaches, the "unwashed masses" ran rampant over the area & quickly reduced it to the largest middle class Riviera the world had ever seen. With everything below the high tide mark belonging to the public at large, we are left with the legacy of what is probably the longest, mostly uninterrupted stretch of the finest, world-class, south-facing beach in the world that is accessible to all. Check the HA link - garden and house still stand. Rotate on Bing to the west. There's some sort of outbuilding still standing in the corner. Its pictured in the background of the advertisement.